Lowdown: The familiar story of Snow White receives the swords & sorcery treatment. We’ve all heard, probably too many times, that there are many ways to skin a cat. The real question is why would anyone want to do so in the first place? That is the question that bothered me when I sat down to watch Snow White and the Huntsman. Or rather – why a reboot? Answers are delivered relative quickly and effectively. Yes, we follow the familiar story of the evil stepmother witch (Charlize Theron) and pure hearted Snow White (Kristen Stewart); but we quickly realize this is no Disney animated feature. This is a rough world that the story is taking place it, a very Lord of the Rings like universe of swords & sorcery and heavily made up Scottish accents (Snow White even has her own Braveheart motivation speech for the troops). Even the dwarves, who make their appearance rather late in the game, are blatant copies of their LoTR mates. If you insist on some finer plot details then here they are. The evil witch takes over the once fair kingdom, killing all royalty with the exception of Ms White whom she keeps imprisoned for the sake of us having a film. A decade or so later the kingdom is dying but the witch is still holding the reigns, keeping herself young by consuming the youngness out of teen girls. She then learns that she can win herself immortality by doing the same to Snow White, which queues in White’s escape. 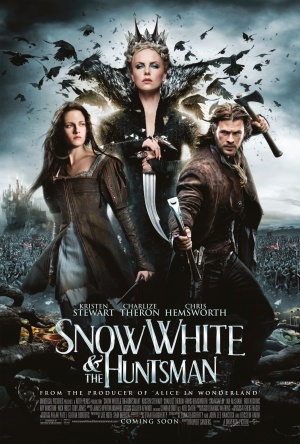 The escape is aided by one Huntsman (Chris Hemsworth of Thor fame), but there is also a former fellow Prince, now an adept warrior, that is seeking to save Snow White (Sam Claflin). Because we need some sort of a love triangle. What follows is an interesting and often thrilling tale. Much of it is cliché stuff, in the sense that we’ve seen it all in other movies already; yet Snow White and the Huntsman does well in providing fine entertainment without stooping too low to provide sweeter than sweet endings. There is quite a fine cast here, too: in addition to the previously mentioned, we have the likes of Ian McShane, Bob Hoskins, Ray Winstone, Nick Frost and Eddie Marsan in the roles of rather English dwarves. These talents are rather underutilized; Theron is good, as she always is, but her made up accent tended to annoy me. No, it was Hemsworth that impressed me the most here, easily fitting into the role of an unlikely Han Solo. Returning to the question I opened up with, why did we need to skin the cat that is the Snow White story yet again? The multiple choice answers include people wanting to make money, people wanting to generate fine entertainment, and an artistic need to give us a nice analogy on the ravages of old age. Snow White shows the old being cast away and rejected by the young as well as old age doing its best to make a hopeless stand. There is no going about it, according to this movie: for good or bad, we all wither away and leave the scene for the younger generation to take center stage. It is the natural way of a world that relies on constant renewal. I, for one, am starting to feel for that old witch. Copycat scene: I mentioned the way Snow White and the Huntsman “borrow” from the likes of The Lord of the Rings already. There is, however, an evil magic forest scene early on, the scene where the Huntsman has to make his choice on whether to help Luke (Snow) fight the evil Empire (witch) or not. Setting and all, it is awfully reminiscent of The Princess Bride. Overall: Never transcending yet fine entertainment and a worthy addition to a worthy genre. 3 out of 5 stars.